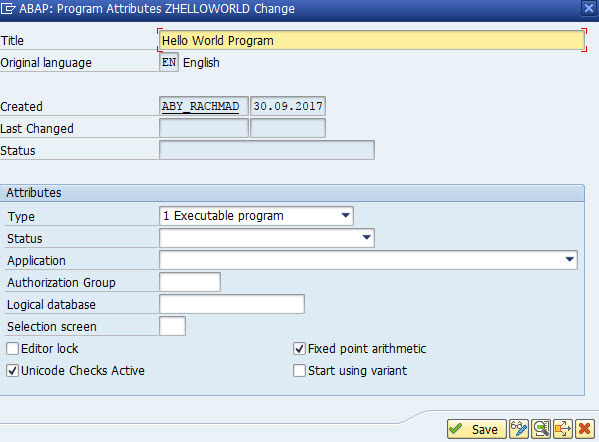 SAP ABAP Tutorial – If you are using Transaction SE80 as your ABAP IDE, select PROGRAM from the dropdown in the center of the left side of the screen, type “ZHELLOWORLD” in the textbox below it, and press ENTER. A new popup that allows you to set the name of the program. 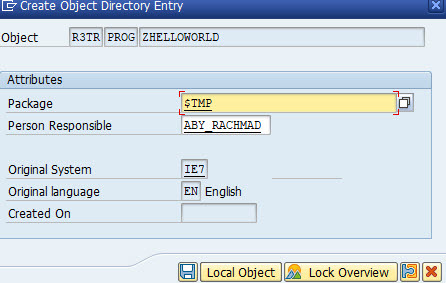 Leave it as ZHELLOWORLO, and for this tutorial we will leave the CREATE WITH TOP INCLUDE box unchecked. In the PROGRAM ATTRIBUTES popup, change the TITLE to “Hello World Program” and ensure the TYPE is EXECUTABLE PROGRAM. You can leave the rest of the options set to their defaults and You should refer to your own company’s development standards when determining if the other attributes if your company does not require values to be entered in these attributes, we recommend avoiding them. These following explanation for all field. APPLICATION A SAP nnodule that is required for your program. a predefined view of the database. screen tied to a given logical database. restricts them from making changes. you can lose data stored as fractions. ru nning a report) for the program to be started. click the LOCAL OBJECT button if you don’t want to transport your program to QA or PROD later, and click the SAVE button. Double click on your program name to open it, and click EDIT to begin making changes. and now you can write your first ABAP Program. REPORT zhelloworld. WRITE 'Hello World'. Next, you need to activate the program. When editing any ABAP programs code, the program will be inactive until you activate it, meaning that the most recently activated version will be run until you activate a new one. Now, run the program by pressing 1m or by clicking the RuN PROGRAM to Executing an ABAP PROGRAM button in your IDE and you will see the result as shown in following screen. Now that you’re familiar with how to create your first program, next article of SAP ABAP Tutorial for beginner we will learn about Data Types in ABAP.